That could simply be a signature issue, what file(s) of malware are you running against? Have you submitted FPs? Is ClamAV enabled or disabled? Are you mirroring the settings of 6.2 and 6.0.8? ﻿﻿ Is ClamAV enabled or disabled? Are you mirroring the settings of 6.2 and 6.0.8? ok. i got my answer! If you can obtain the files, I can do a comparison, but these would all be signature based. Signatures are what 'find' the malware / ransomware etc. The signatures aren't going to change version by version from 6.0.8 to 6.2, unless the malware itself is changed (or there was an issue with the signature in the first place, to which we push updated signatures out). I am not disbelieving you, But without knowing the exact file, the exact signature- this is a lot of 'he said', 'she said'. There was a few issues with some signatures about a week ago, in regards to detecting certain files, as malicious when they weren't, which were corrected. Though, nothing should of changed (other than the signatures possibly and I don't know that without the sample malware file(s)). ﻿ Signatures are what 'find' the malware / ransomware etc. ﻿ The signatures aren't going to change version by version from 6.0.8 to 6.2, unless the malware itself is changed (or there was an issue with the signature in the first place, to which we push updated signatures out). ﻿ There was a few issues with some signatures about a week ago, in regards to detecting ﻿certain files, as malicious when they weren't, which were corrected. The cloud stats message, shouldn't have anything to do with you having the latest signatures. It should not leave you unprotected. You will need to make sure you are running the same signature set on both versions. ﻿ You will need to make sure you are running the same signature set on both versions. Can you send me the quarantined file ? So, I can run some tests via a private message? I can see if I can get it working. Though, the cloud option being '0' shouldn't matter because signatures are what protect / find files to which are quarantined. Hello all, I have been a long time user of Immunet (on and off) pretty-much since it was first released as a very simple cloud-only process monitor. Anyway, I thought I'd register on here so I could start trying to give a bit back. I've identified another defect in the latest version of Immunet, and it seems to be pretty reproducible. Basically, after a while, files get quarantined with no confirmation message popping up above the task bar. 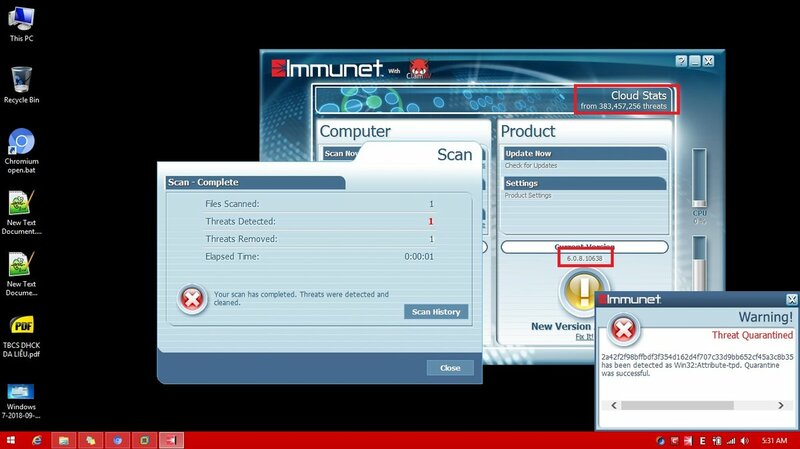 I always set Immunet to "ask me" on detections, as i don't want it doing anything without my explicit say-so, particularly given how just one faulty signature can completely screw-up your PC (think of the Bitdefender "Trojan.Fakealert.5" fiasco in 2010). I think I have traced the problem to either the ClamAV module or the initialisation of the Immunet service itself. There are three different paths that lead to this problem. 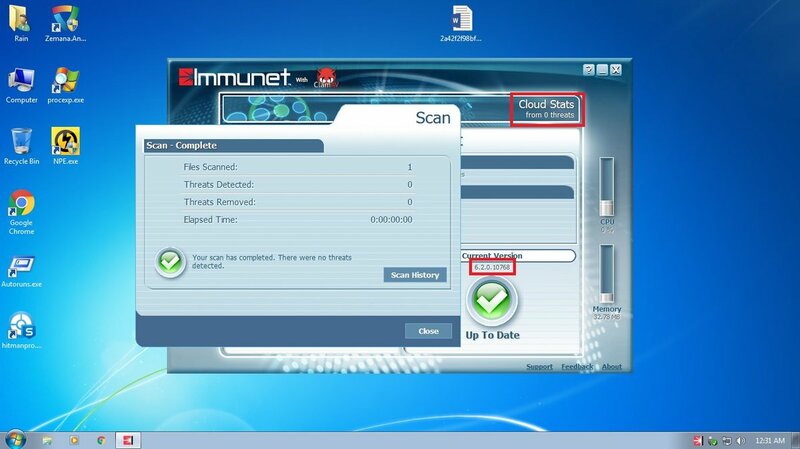 Install Immunet 6.0.8, and set it to "ask me" on detections. Enable blocking, all cloud engines and ClamAV. Optionally enable detecting packed files. Download the eicar test file. --> Everything works as expected. Upgrade to Immunet 6.2.0.10768, reboot if necessary, then download the eicar test file --> File is quarantined with no user notification(!!). Install a fresh, new copy of Immunet 6.2.0.10768. Ensure it is set to blocking mode, enable "ask me" on detections, and enable all cloud engines and ClamAV. Download eicar test file. --> Everything works as expected. Now switch off ClamAV. Download eicar test file. --> File quarantined with no user notification. Re-enable ClamAV. Download eicar test file. --> File quarantined again with no user notification. Install a fresh, new copy of Immunet 6.2.0.1068. Ensure it is set to blocking mode, enable "ask me" on detections, and enable all cloud engines and ClamAV. Download eicar test file --> Everything works as expected. Verify the service is running and, if it makes you feel better, close the tray icon and re-open the immunet gui. Now download the eicar test file --> File is quarantined without user notification. This seems pretty reproducible and consistent on a Windows 10 64-bit machine that's fully patched. Please note I'm not deleting or restoring anything from quarantine, so I can tell the quarantine is still happening, because the number of the files increases. To check, I verified this behaviour with several different viruses from my malware collection. The behaviour is the same regardless of whether the detection is the Eicar test file, or one of several different real malware-samples. So, to summarise - stopping and restarting the Immunet service, or disabling then re-enabling ClamAV breaks user notifications, and there doesn't seem to be a way to restore them without reinstalling Immunet from scratch. Incidentally, I discovered the behaviour on stopping and restarting the service, because I've written a script to detect an Immunet installation and stop the service, copy the Securiteinfo and Sane Security custom databases into the "ClamAV" folder, then restart the service. It really improves Immunet's detection rate from about 50-75% depending on the malware that day to over 90% in my (very limited) testing. I will post the script in another thread when I get the chance. Is it "safe" now to switch to the latest version,or... ? Thanks in advance for yours replies. There was one signature issue, which was corrected. Report FPs via the immunet website. So is it ok to upgrade to 6.2 ? Is the cloud issue fixed ? It was never not safe. You can upgrade. Cloud issues that reported '0 people protected' is fixed. EDIT: Windows can't even recognize the AV status,I've got the mini shield icon with the yellow triangle with the ! Yeah, I'm seeing the same thing too Cipollino. The cloud stat bug has seemed to have reared it's ugly head once again! Thanks for reporting this. It seems you also encountered some other issue with the UI that I'm not seeing at present. Are you getting this error with the Last Scanned, Last Updated data or both? 2 Process's errors & the fact that Windows 10x64 Pro (version 1803 build 17134.376) can't recognize Immunet's status. On a side note setting game mode within the settings won't stick aka every startup I see it not flagged in the tray icon. Thanks in advance for your time and patience,if you require more info,just ask,have a good day sir. Ps: I've got this error after Immunet updated itself automatically. Hi guys, I mistakenly thought you were having some other issue with the UI stats Cipollino. With this new build you do get pop-up messages when Immunet prevents (possibly suspicious/malicious) access to Windows processes by third-party apps. I have an app too (that's completely legitimate) where I get numerous pop-up messages. I also use Gaming Mode so I won't keep having to deal with these notifications. Actually Gaming Mode is automatically reset to disabled when you boot-up. This is a built in security feature in case a user forgot that Gaming Mode is still enabled but that makes it necessary to enable Gaming Mode after every boot-up. I've already put forth the idea, for a future build, that users can make their own custom exception rule(s) for the process protection feature and/or to disable it entirely at the user's discretion in case it becomes too problematic.